Growing up in Vancouver in the 90s, you might remember a little bagel place called the Bagel Street Cafe, and I remember one of my elementary school classmate’s family owning one of the few in Van City. For some reason or another, they started dropping like flies (or if you’d prefer, closing down one by one), and disappearing from the city. I have a love hate relationship with bagels, mostly because once I have 1 or 2, I’ll be addicted for a few weeks. 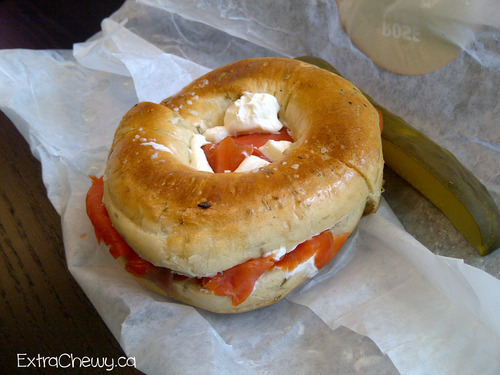 Once upon a time, I’ve gone as far as having 3 bagel with cream cheese a day – breakfast, lunch, and dinner. I love bagels, but i hate that I get addicted to them. Fast-forward to February, with the help of Twitter, I discovered Rosemary Rocksalt. I started following them thinking that it’s a place I can buy, well, rosemary flavored rock salt. It wasn’t till I checked their site out that I learned they’re a bagel shop, opening shortly, on the North Shore on 17th and Lonsdale. While following them, I got a DM stating that since I’m one of their first 1000 followers, I’ve earned a bagel sandwich when they open! Unfortunately, they were still renovating and won’t be opening till Spring (probably a good thing for me since I frequent the North Shore quite a bit). About a month ago, they sent me a coupon code to redeem my bagel sandwich. All I can think of is – YES! THEY ARE OPENED! I finally paid them a visit last week during my lunch break from work and THEY WERE BUSY! I asked the girl behind the counter which of their 5-7 *I think i was 5-7) sandwich she’d suggest for my freebie and she suggested the Montreal Smoke Meat or their Lox & Cream Cheese. 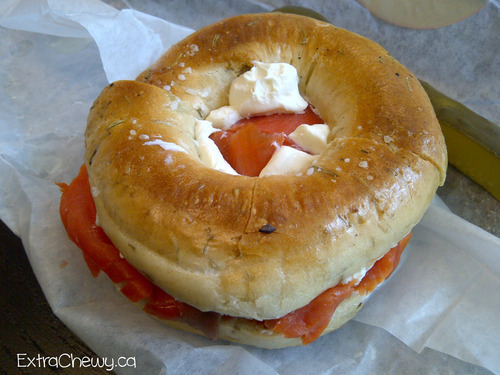 Since I’ve had Montreal Smoke Meat before, I thought I’d give their Lox and Cream Cheese a try. Next thing is the choice of bagel, and well Rosemary Rock Salt of course, how can you not try their namesake bagel? Boy am I glad I picked it. I think that alone with some plain cream cheese would be amazing! The Lox & Cream Cheese goes for $7ish and I grabbed a tea (whole leaf Jasmine that smelt amazing) to go with the sammy. And without further adieu… Oh there are capers in the middle, of all those smoke salmon! I will definitely swing by again in the next little while and probably find myself a Bagel Anonymous to go to as well. 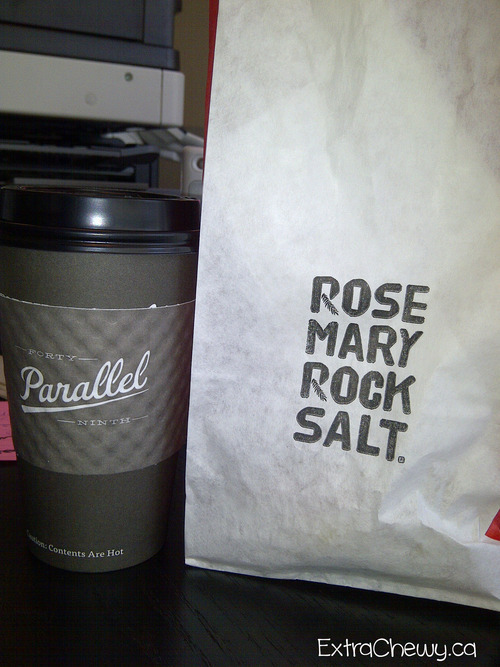 Oh and side note to those coffee lovers out there, they serve 49th Parallel coffee at Rosemary Rock Salt!!! 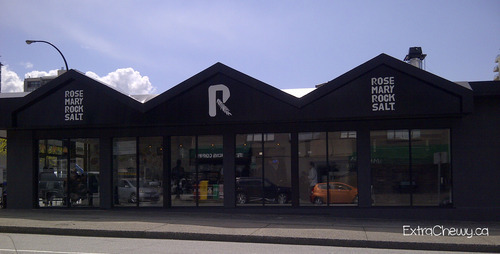 I heard their coffee’s amazing from my coffee obsessed uncle in Ontario!